It was a day that his peers talk about in awe. 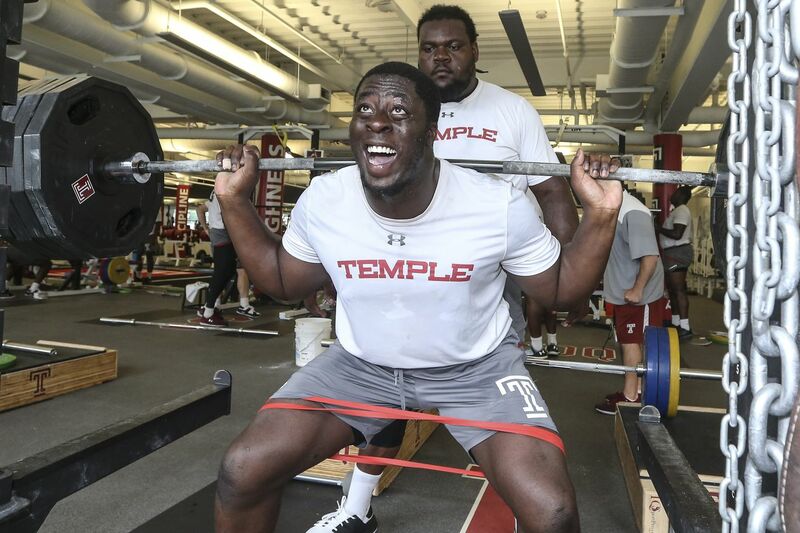 On July 12, Temple graduate student and defensive tackle Michael Dogbe set a personal record by bench-pressing 505 pounds. That's right, 505 pounds, for the 6-foot-3, 280-pound Dogbe. This is a player who entered Parsippany Hills High in North Jersey weighing 160 pounds. Dogbe said he was pushed around the football field as a high school freshman and was told for that not to happen he had to hit the weights. He hasn't stopped since. "As soon as my freshman high school season ended, I was the first guy in the weight room and the last guy out and in four years I never missed a day," Dogbe said. "I grew to be 230 as a senior." He has grown even more at Temple. Dogbe has played in 41 games for Temple, with 14 starts. This is expected to be his breakout season and he is considered an NFL prospect. Dogbe set the tone this summer in the weight room, where he has performed tremendous feats. For instance, his name is on the weight room wall for squatting 685 pounds, the most by a Temple defensive lineman. He has also bench-pressed 225 pounds 37 times, another school record for a defensive lineman. His teammates have seen him lift an inordinate amount of weight, but surpassing 500 pounds was on another level. Here is how those who saw it recall the day. David Feeley, Temple head strength and conditioning coach: "When he walked in the room, we knew it was going to happen. He has such a great demeanor about him. When he has a goal in mind, he is going to get it." James McHale Temple senior offensive tackle: "When we have big weights like that, coach Feeley will line us up in a tunnel right outside the weight room doors. Mike ran outside the weight room and we kicked the doors open and ran through the tunnel, slapping him on the back and rooting him on." Feeley: "We call it the tunnel of pain. It's great." McHale: "As he is getting ready to lift, everybody is around him screaming 'GDQ Greatness Doesn't Quit.'" Michael Dogbe: "I felt good. It was a great accomplish, that was my goal for a very long time and to get that number up it meant the world." McHale: "When he made the lift, everybody was going nuts." Shaun Bradley, junior linebacker: "That was ridiculous. Actually, my dad did 505 like maybe six years ago. I swear I watched him do it in the gym. So when Dogbe did it, I had a little flashback. That is crazy." Anthony Russo, Temple redshirt sophomore quarterback: "I saw all the plates on the bar and said is somebody squatting today? I thought this was max bench day. I see Dogbe under the bar and bench it like it was nothing. That is more than my max squat is and he just goes under and maxes one rep like it is nothing. I have never seen anything like that." Bradley: "We were going crazy, nobody expected that. 505. Come on. That is ridiculous. It was wild, though." One person who expected him to do it was Feeley. Feeley: "You watch Marvel Comics and watch the Incredible Hulk do some crazy things and you are like wow. But you say he is supposed to do that, but it is still really cool." Bradley: "My max is about 315. And he topped that by nearly 200 pounds. That is insane." Feeley: "Everybody freaked out, everybody went crazy, everybody supported him. It was cool positive energy." Dogbe: "When I did it, my teammates were excited and that made the moment that much better." Russo: "We have never seen in our lives anybody bench 500 pounds. It was a great moment when he did it, such a cool experience to be able to see that." Feeley: "You have to have a very serious mind-set of what it is going to take to achieve such a hard goal. People think you just have to be strong. No, you have to show up for that. Nothing can go wrong. You can't have a 95 percent day when you are lifting something that heavy. All that bar has to do is sway a quarter of an inch one way or another and it's not going up. So, to his credit, that was as perfect as a rep he could come up with." Dogbe: "If you put up enough weight in weight room, you can go out on the field and basically play with anyone. It is something you have to learn how to transition to the football field, bringing that strength there." Dogbe's teammates and coaches were ecstatic, not only because he achieved a herculean feat, but because he is among the most respected and well-liked players on the team. Not overly boisterous, he leads by example. Dogbe is also respected for his academic work, having already earned a degree in communications. Temple coach Geoff Collins: "The way Michael has approached every single day since he has been in college is what Temple football is all about. As special as he is on the field, he's just as special off the field. He is an unbelievable human being." Feeley: "God only gives you so much ability and you have to work for a whole lot. Everybody respects Mike and respects his work ethic and how hard he has worked. You don't just wake up and do that. There are very few people on the planet Earth who can do that. Mike has worked incredibly hard. The respect for him from the players and coaches is tremendous. I am a better person just by meeting him, let along coach him. I can't say good enough things about Michael Dogbe." Temple safety Delvon Randall: "Having a guy like Michael as a teammate makes me a better player. He is the type of player that you are proud to say he is your teammate."